A few weeks back, the legal world was treated to a ruling in one of the sillier cases to see a courtroom in recent memory–a lawsuit over whether a monkey could hold a copyright if it steals a camera and takes a selfie. Lo and behold, the answer is of course not. The law does not offer copyright protections to any type of animal. This probably seems obvious. However, this most recent ruling on the matter is the result of years in the courts. The situation the case comes from is more interesting than the ludicrous case at hand and has provided some results in the past that are interesting legal precedent. What’s more, it’s a great opportunity to explain a bit of how copyright itself works as a body of law. 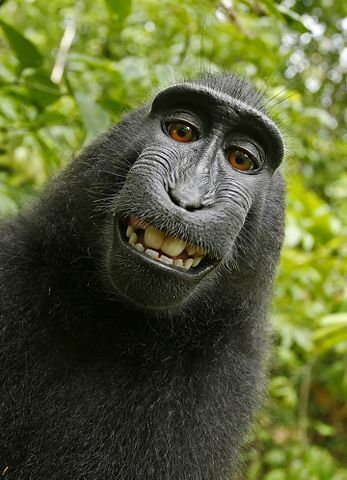 With that in mind, let’s look at the facts that gave rise to this situation, copyright law itself, the cases that arose from this monkey’s selfie, and what it all means–besides that people sometimes bring some very strange lawsuits. The origins of the monkey selfie saga are simple. A nature photographer named David Slater was in Indonesia, having spent weeks befriending a group of monkeys. He familiarized the monkeys with the cameras he brought, and set them up to catch pictures of the group. However, one of the monkeys–known as Naruto–grabbed one of the cameras and took a series of selfies with it. This created several quite memorable photos. These photos, however, led Slater into a series of disputes that would ultimately essentially bankrupt him. The first legal controversy began after Wikipedia posted the photos to their list of free-to-use pictures. Slater took some umbrage to this and asked that they take them down as, according to him, they were his to sell. Wikipedia wasn’t having it however, and argued that he couldn’t hold a copyright in the pictures because they were taken by an animal. An interesting argument, and one that we’ll need to look at copyright law a little bit to understand. Copyright law provides protection against copying to authors of original creative works. After the duration of a copyright expires, a work passes into the public domain and the public can use it as it is for any legal endeavor they choose. However, while it’s valid, a copyright provides several exclusive rights to its owner. These rights include the exclusive ability to reproduce, distribute, and—most importantly for fan-made works—prepare derivative works. Derivative works are works based on a copyrighted work. To be valid, a would-be copyright must be original and fixed in a tangible medium. Originality is low standard, requiring only minimum creativity. For example, a creative arrangement of phone numbers in a telephone book would be enough to qualify. Fixation only requires you to store your work in a medium that can be perceived, reproduced, or otherwise communicated. Today, copyright protection attaches as soon as you place an original work in a fixed medium—allowing you to stop people from using your work without permission and sue them for actual lost profits based on their actions. Registration provides you with a presumption of validity for your copyright and the ability to sue for statutory damages—which nearly always exceed your actual loss. Every one of these requirements and elements of copyright is complicated enough to have an entire body of law behind how they work. However, perhaps not surprisingly, one of the less discussed areas is non-human copyright. On top of this, the implications of what goes into “creating” a work were one of the more complicated of the many elements of copyright. As we mentioned, the first case against Slater was not the PETA case that just saw a final ruling, it was Wikipedia–and more specifically WikiMedia–arguing that they could give away Naruto’s selfie because it was taken by the monkey itself. Slater argued that he had a right to the picture because he created the situation for the photo to be taken in the first place–familiarizing the monkeys with the cameras, earning their trust, setting up the equipment. These are all valid arguments, candid photos frequently receive copyright protection based on choosing the positioning, composition, etc, for the photo. If you take the selfie yourself, it almost certainly has copyright protection. However, there was a real question of whether it mattered that the monkey himself pushed the button on the camera. This question raised a great deal of debate in the intellectual property law community. The US Copyright Office clearly ruled back in 2014 that works created by non-humans don’t get copyright protection. A court ruled that copyright law didn’t apply t animals in 2016. This served to resolve the case somewhat, albeit in an unsatisfying manner. The matter of what set up would be enough for copyright without pressing the button on the camera remains mostly unresolved. To be honest, give the number of pictures the animals out there are taking themselves, it seems unlikely to be fully resolved anytime soon. The second substantial lawsuit to come out of Naruto’s romp with a camera has been a suit brought by PETA against Slater in 2015 trying to assert that Naruto himself owns the copyright in the selfie. PETA brought the case on behalf of Naruto himself as his next friend. Having read the rulings from the last case, you probably have a fairly good idea how likely this case was to succeed. However, the case has been ongoing for years before this most recent ruling. Even after a 2016 ruling saying, once again, that animals can’t hold copyright protections PETA decided to appeal their case to the Ninth Circuit Court of Appeals. Likely due to the sheer expenses of the case, Slater entered a settlement with PETA in late 2017 where he promised to donate a full quarter of his profits on the monkey selfie pictures to wildlife organizations. With this out of court settlement in place, the parties made a joint movement to dismiss the case. What’s more, likely as a condition of the settlement, they additionally requested vacatur. Vacatur is a legal term which essentially means a request to nullify the lower court ruling on the issue. The Ninth Circuit was not interested, not only did they refuse vacatur they also refused to dismiss the case without having one last say on the matter. They ruled in favor of Slater, reinforcing that animals have no copyright rights and no standing to sue based on them. PETA obviously didn’t take kindly to this, releasing statements that the Copyright Act is “[discriminating] against [Naruto] simply because he is a nonhuman animal.” This statement, more than anything, serves to highlight how silly this case is. As of a few days ago, the case has seen another twist to its already strange saga. One of the Ninth Circuit judges on the case has requested a rehearing on the case, but it seems they want a chance to bring an even more substantial legal hammer down on PETA’s case. They will potentially amend their ruling to make it clear that a human doesn’t have standing to sue on behalf of an animal in the first place when it comes to asserting non-existent copyright rights. This would put a complete stop on similar efforts to PETA’s suit in the future. PETA’s was and is silly, but it wasn’t without cost. Slater only made around £2,000 on a picture that nearly bankrupted him in legal fees. He occasionally didn’t even have funds to come to the U.S. to defend his case. An unfortunate situation for somebody who says he pursued nature photography out of a love of animals. While some interesting law came out of this case, PETA’s attempts have accomplished essentially nothing. Things may be looking up for Slater. As of last month, Slater has sold rights to a documentary on the monkey selfie saga. What’s more, the Wikimedia case continues the expansion of our understanding when it comes to how copyright law works. After over 100 years developing our law on the issue, copyright continues to grow and change as we work out its outer limits.